REDDING, Calif. - Seven Simpson University students will be inducted Friday evening into Phi Alpha Theta, the national honor society for history. 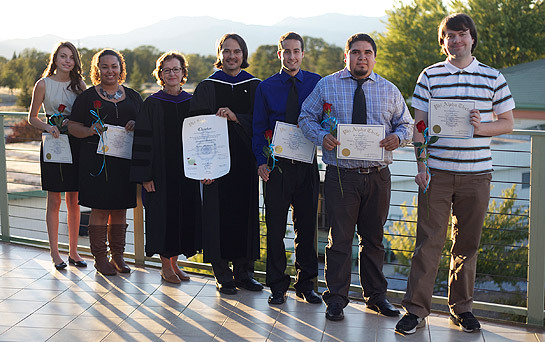 Myrsadies Brown, Daniel Cross, Jose Reyes, Kelly Warner, and recent graduates Justin Buchert, Tim Medeiros, and Ahnaleza Wilseck will be honored during the 6 p.m. ceremony inside the J.D. Williams Suite in the Owen Student Services Center. The event will also mark the installation of the university’s chapter of Phi Alpha Theta. Phi Alpha Theta has more than 350,000 members and 860 chapters. Simpson University’s History Department learned this summer that its yearlong petition to add a chapter was granted. “We’re thrilled,” said Dr. John Ayabe, associate professor of history and chair of the Division of Humanities and Fine Arts. “Having a chapter of Phi Alpha Theta will enable our history students to become part of a national organization of history scholars and lets us recognize their academic achievements." To become a member, undergraduate students must complete a minimum of 12 semester hours in history, achieve at least a 3.1 grade-point average in history and an overall GPA of 3.0 or better. Simpson University’s History Department includes 22 students and three professors. The history major is designed for students who may pursue careers in education, public history, business, commerce, government, or politics. It offers specializations in pre-law, U.S. history, European history, and non-U.S./non-Western history. For more information, visit simpsonu.edu/history. Phi Alpha Theta was established in 1921 by a professor at the University of Arkansas. In addition to Phi Alpha Theta, Simpson University also has chapters of the following national honor societies: Alpha Chi, Kappa Mu Epsilon (mathematics), Psi Chi (psychology), and Alpha Sigma Lambda (for adults in the Adult Studies program). Photo: From left, Kelly Warner, Myrsadies Brown, Dr. Cherry McCabe, Dr. John Ayabe, Tim Medeiros, Jose Reyes, and Daniel Cross. Photo by Falicia Schuman.